On June 6, 2013, I was working at Casa Carrie in Simi Valley, California. 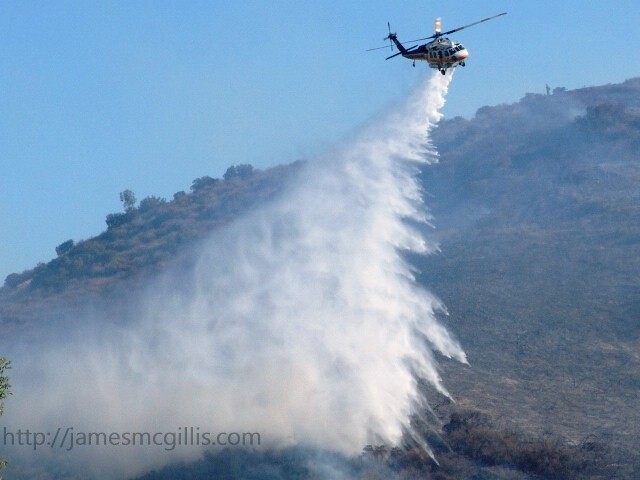 From nine in the morning until noon that day, the Ventura County Fire Department was conducting live helicopter fire drills at nearby Hummingbird Nest Ranch. 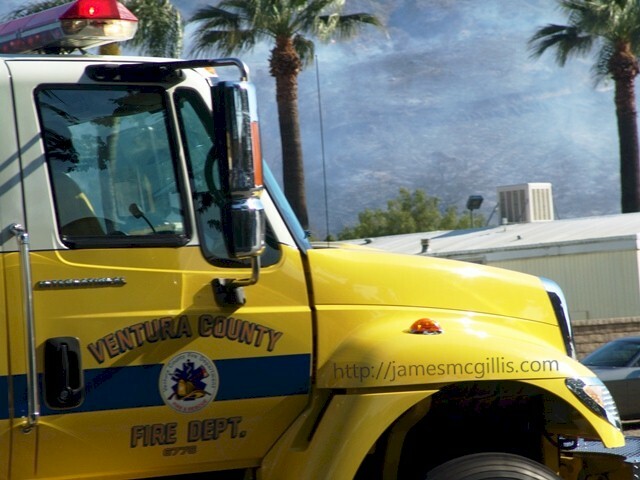 Several Ventura County Fire Department helicopters were loading water at a helipad in the nearby hills. Over Casa Carrie, they flew to their destination about a mile away. At the time, they did not know how timely their practice was. By 4:00 PM, I realized that the sky in Simi Valley had turned orange, indicating that there was a brush fire nearby. As I looked west across Simi Valley from the backyard, I could see a huge plume of dirty brown smoke drifting eastward. Not wanting to miss a brush fire so close to my location, I grabbed my camera, jumped into my Jeep Wrangler and headed across the valley. Upon arrival at Los Angeles Avenue and Stearns Street, I found a police roadblock. A quick turn into the Albertson’s Supermarket parking lot allowed me a front-row view of the hillsides to the south. Although the fire was still active, firefighters had established a perimeter around most of it. 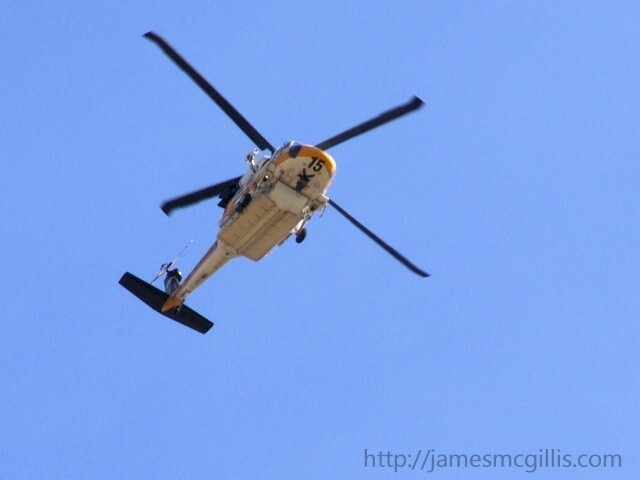 By then, Los Angeles County fire helicopters had joined the Ventura County choppers that I had seen earlier in the day. While at least four helicopters shuttled water from the helipad near Casa Carrie to the fire, crews on the ground were clearly gaining the upper hand on the fire. In its earlier stages, visibility had been minimal. 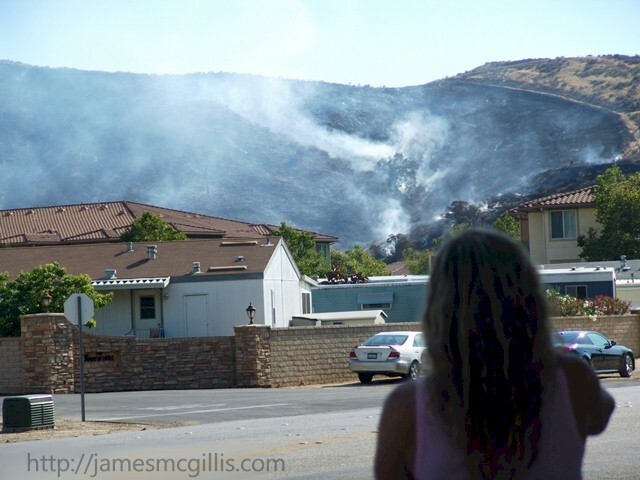 The huge smoke cloud indicated that the fire was consuming both chaparral and grasses. If the winds had shifted, beginning to blow to the south, the fire could have taken off over the ridges and on to the grounds of the Santa Susana Field laboratory. Other than older local residents and nuclear regulators, few people know that under the Atomics International division of the old North American Aviation (later Rockwell International's Rocketdyne Division) built the first commercial nuclear reactor on that site in the 1950’s. In 1959, it was also the first commercial nuclear reactor in the United States to experience a core meltdown. Kept secret from the public for many years, the Santa Susan meltdown released more radioactive material than the later Three Mile Island nuclear incident in Pennsylvania. To this day, no one knows what happened to thousands of pounds of sodium coolant present at the time of the meltdown. It dispersed either into the air or on to the ground. 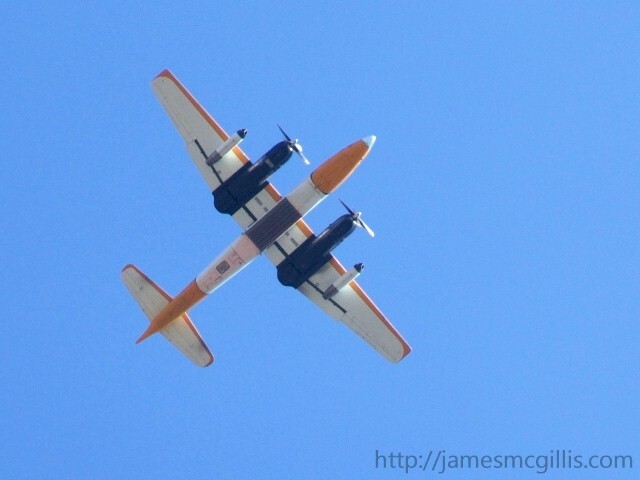 When a brush fire looks to be out of control and heading for a nuclear contamination site, it is time to call in the Air Force, or at least the USDA Forest Service "Air Force". 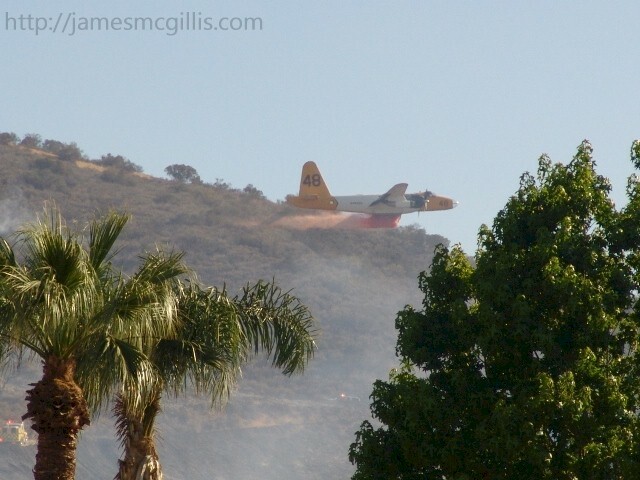 Rather than risking a wildfire within a nuclear contamination site, the fire bosses in Simi Valley called for massive air support. Soon, three large air tankers arrived to augment the helicopter fleet and hand crews already on scene. First on scene was Neptune Aviation Services’ new “Tanker 41”, a BAe-146, four engine, "next generation" commercial jet retrofitted as an air tanker or "fire bomber” as the Canadians like to say. Looking like a lost commercial aircraft, Tanker 41 made wide circles around the scene as it waited for a smaller, twin-engine spotter plane to arrive. Next up was the Minden Air Corp "legacy" “Tanker 48”, a Lockheed P2V-7 maritime patrol and anti-submarine warfare plane retrofitted for aerial firefighting. With the first P2V-7 flight having taken place in 1945, it is safe to say that this bumblebee-painted beauty was older than her flight crew was. Featuring two 3700 hp. turbojet engines and two 3000 lb. thrust jet engines, the elegant aircraft both rumbled and screamed as it maneuvered overhead. Although a third air tanker joined the other two, I was not able to identify it, since the big aerial fire battle was about to begin. While the four helicopters headed off for a refill, what looked like a Beech King Air twin-engine spotter plane buzzed the fire ridge at low altitude. 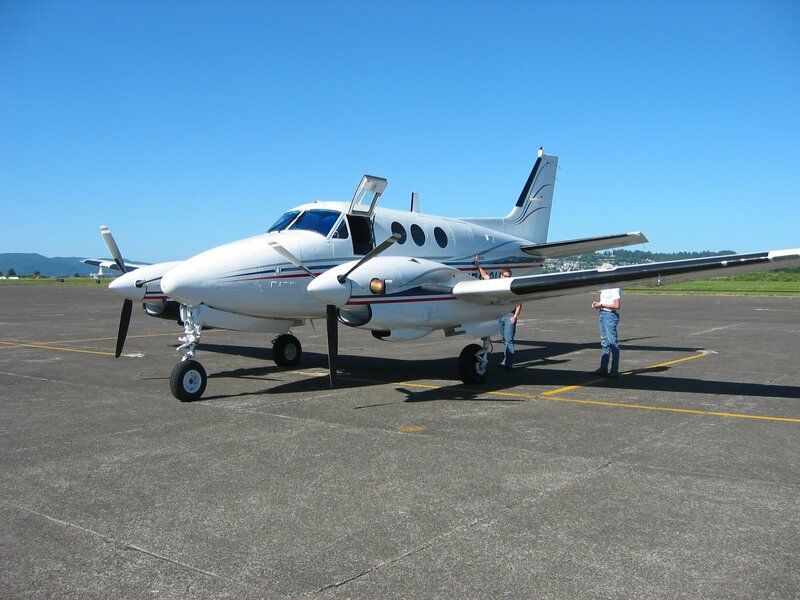 Its speed and grace reminded me of Sky King, who flew a similar looking Cessna in the old TV program by the same name. By then, the aerial ballet was getting exciting. Perhaps since it had been on scene the longest, the four-engine BAe-146 got first shot at the dying fire. 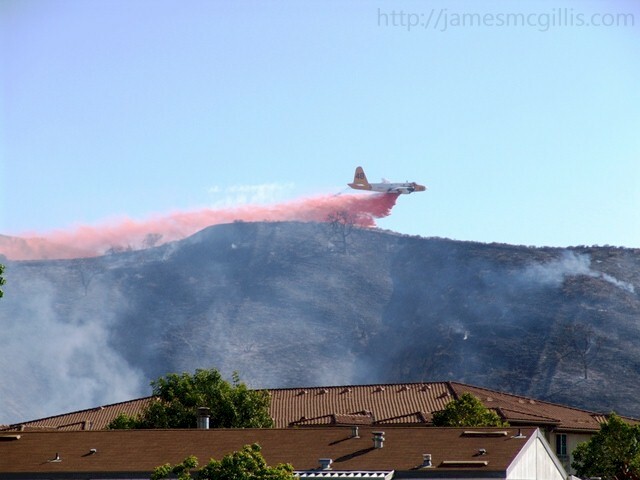 With “Sky King” in the lead, the two planes flew a straight and level route along the highest ridge of the fire. At the drop point, the smaller plane puffed out two spurts of white smoke. At that spot, only a few seconds later, the big jet cut loose a torrent of bright pink fire retardant, mixed with water. It was a spectacular sight. 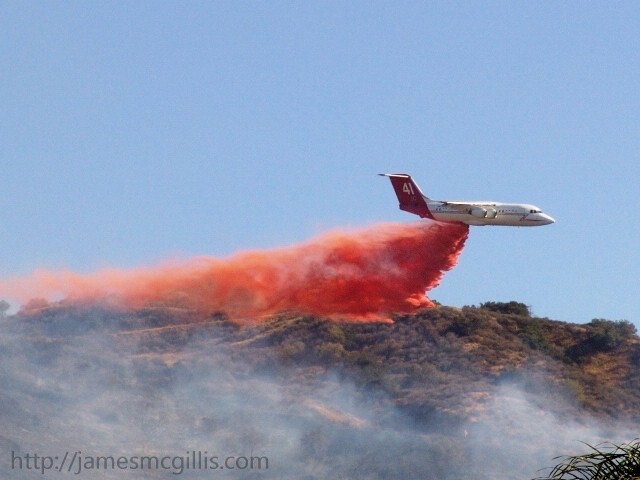 Only a few minutes later, Tanker 48 took its run along the westerly portion of the same ridge. Judging by the fifty-foot tall hulk of a burned out oak tree, the P2V-7 appeared to clear the ridge by little more than 100 feet. Distances can be deceiving and the pilot dropped his load just behind the ridgeline, so he may have dropped at two hundred feet above ground, but little more. When I realized that the mysterious “Tanker #3” was going to make a drop, head-on towards my camera, I switched from still shots to video. Dropping his fire retardant in a saddle along the ridge just west of the previous drop, the mystery tanker put an end to any threat that the fire would escape its lines and head toward the Santa Susan Field Laboratory. I have lived in Southern California for most of my life. I grew up in Burbank, one block from the chaparral-covered Verdugo Mountains. As James Taylor sang, “I’ve seen fire and I’ve seen rain…” Never, in my life have I seen such a well-coordinated firefight. Congratulations to Ventura County Fire Department, their mutual-aid affiliates from other jurisdictions and the fire-fighting air force of the USDA Forest Service. In congressional and state budget battles, firefighting is just one more line item to cut when possible. That the so-called “sequestration” has cut the federal fire suppression budget by twenty percent in 2013 is unconscionable. Before any more of the Western United States goes up in smoke, federal first responders to fires, floods and weather disasters should have their funding restored. Let us offer our first responders the credit they deserve and the funds necessary to do their jobs. What I saw in Simi Valley this week is a prime example of “your federal, state and local tax dollars at work”.